Marshall McLuhan was one of the most brilliant and original thinkers of the 20th century. He was so far ahead of his time that he predicted the future and offered a critique of human behavior in a media saturated world that is perhaps more valuable in today�s Internet age than it was in his own time. McLuhan pioneered the study of Media, unified Art and Science, and warned us about the perils of a televised, computerized, famous-for-15-minutes, social media world. A world where we would live in each other�s faces, and become so alike, so isolated, so anonymous that violence would become a scream of identity, a way of saying, �I am not invisible.� McLuhan tried to teach us to guard against these dehumanizing, debasing effects of technology, and a thousand other things, but we got reality television anyway. The centennial celebration of McLuhan�s life and the re-release of his books has led to a surge of new interest in his thinking and teachings. 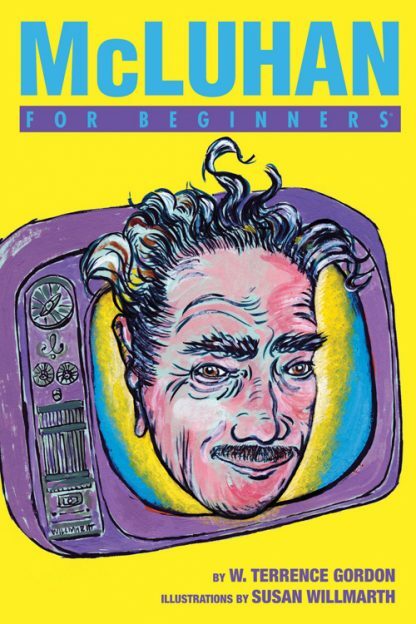 McLuhan For Beginners provides an essential introduction that is clear, comprehensive, and easy to remember. It is full of wise and witty art by Susan Willmarth that is a perfect match to W. Terrence Gordon�s writing. McLuhan envisioned the media generated Global Village before it existed, and no one since McLuhan has described its allure and pitfalls better. W. Terrence Gordon has published more than twenty books including Marshall McLuhan: Escape into Understanding (Gingko Press) and Linguistics For Beginners. Gordon has also been the editor of the Marshall McLuhan Publishing Program at Gingko Press for the past 12 years, and is currently Professor Emeritus at Dalhousie University in Halifax, Nova Scotia. When he is not busy writing or teaching, Gordon photographs the haunting beauty of Nova Scotia, Canada, where he has lived since the 1970s.